Mixed Tocopherols Oil contains natural mixed tocopherols which are obtained from sunflower oil by suitable physical means. 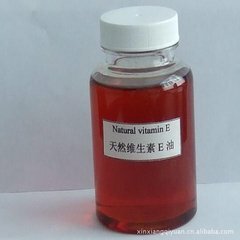 It is intended for use as an antioxidant in the dietary supplement, food and cosmetic industry. soft-shell capsule, and also used widely in cosmetics. Package： 20KG & 200KG steel drums (Food grade);or according to customers' requirements. Storage： It shall be stored at ambient temperature, dry conditions, protected from heat, light and oxygen. Shelf life： 2 years in the unopened original container.